Total Glutathione Quantification Kit - Reduced and Oxidized Glutathione | Cell Biolabs, Inc. The OxiSelect™ Total Glutathione Assay Kit is a quantitative assay for measuring the total glutathione content within a sample (GSH/GSSG). Glutathione Reductase reduces oxidized glutathione (GSSG) to reduced glutathione (GSH) in the presence of NADPH. Subsequently, the chromogen reacts with the thiol group of GSH to produce a colored compound that absorbs at 405 nm. The total glutathione content in unknown samples is determined by comparison with the predetermined glutathione standard curve. 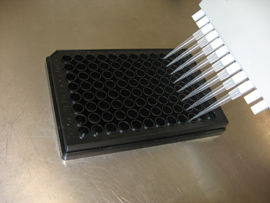 The rate of chromophore production is proportional to the concentration of glutathione within the sample. The rate can be determined from the absorbance change over time. Metaphosphoric acid is provided to remove interfering proteins or enzymes from samples. Figure 1: GSSG Standard Curve. 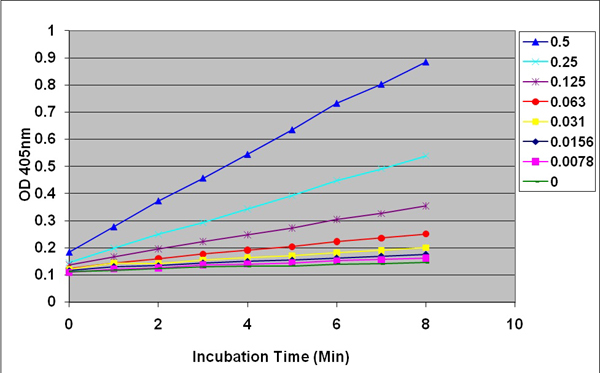 OD 405nm versus incubation time as a function of GSSG concentration. Suntiparpluacha, M. et al. (2016). Triamcinolone acetonide reduces viability, induces oxidative stress, and alters gene expressions of human chondrocytes. Eur. Rev. Med. Pharmacol. Sci. 20:4985-4992. Kao, C.W. et al. (2016). A Chinese cabbage (Brassica capetris subsp. Chinensis) T-type glutathione-S-transferase stimulates Arabidopsis development and primes against abiotic and biotic stress. Plant Mol. Biol. 92:643-659. Murad, H. A., et al. (2016). Oral thearubigins do not protect against acetaminophen induced hepatotoxicity in mice. Trop J Pharm Res. 15:1909-1914. Yamada, H. Y. et al. (2016). Systemic chromosome instability in Shugoshin-1 mice resulted in compromised glutathione pathway, activation of Wnt signaling and defects in immune system in the lung. Oncogenesis. doi:10.1038/oncsis.2016.56. Yousr, M. et al. (2016). Antioxidant effect of egg yolk peptides against tert-butyl hydroperoxide induced oxidative stress in Caco-2 colon cancer cells. Food Sci & Technol. 4:36-41. Lao, T. et al. (2016). Hhip haploinsufficiency sensitizes mice to age-related emphysema. Proc Natl Acad Sci U S A. doi:10.1073/pnas.1602342113. Saleh, D. O. & Mansour, D. F. (2016). Ovario-protective effects of genistein against cyclophosphamide toxicity in rats: Role of anti-müllerian hormone and oestradiol. Eur J Pharmacol. doi:10.1016/j.ejphar.2016.07.026. Schneebauer, G. et al. (2016). Anguillicola crassus impairs the silvering-related enhancements of the ROS defense capacity in swimbladder tissue of the European eel (Anguilla anguilla). J Comp Physiol B. doi:10.1007/s00360-016-0994-0. Pelster, B. et al. (2016). Improved ROS defense in the swimbladder of a facultative air-breathing erythrinid fish, jeju, compared to a non-air-breathing close relative, traira. J Comp Physiol B. doi:10.1007/s00360-016-0981-5. Patel, N. D. et al. (2016). Persistent Mycobacterium bovis-BCG is resistant to glutathione induced reductive stress killing. Microb Pathog. doi:10.1016/j.micpath.2016.03.004. Iqbal, S. et al. (2016). l-Cysteine improves antioxidant enzyme activity, post-thaw quality and fertility of Nili-Ravi buffalo (Bubalus bubalis) bull spermatozoa. Andrologia.doi:10.1111/and.12520. Omar, U. et al. (2015). Protective effects of punicalagin on Caco-2 intestine cell line under oxidative stress caused by tert-butyl hydroperoxide. J Pharm Nutr Sci. 5:249-256. Arrabal, S. et al. (2015). Pharmacological blockade of cannabinoid CB1 receptors in diet-induced obesity regulates mitochondrial dihydrolipoamide dehydrogenase in muscle. PLoS One. 10:e0145244. Song, J. W. et al. (2015). Protective effects of manassantin A against ethanol-induced gastric injury in rats. Biol Pharm Bull. doi:10.1248/bpb.b15-00642. Lee, Y. M. et al. (2015). Inhibition of glutamine utilization sensitizes lung cancer cells to apigenin-induced apoptosis resulting from metabolic and oxidative stress. Int J Oncol. 48:399-408. Yim, B. et al. (2015). Cadmium modulates the mRNA expression and activity of glutathione S-transferase in the monogonont Rotifer Brachionus koreanus. Toxicol Environ Health Sci. 7:217-223. Zaghlool, et al. (2015). Assessment of protective effects of extracts of Zingiber officinale and Althaea officinalis on pyloric ligation-induced gastric ulcer in experimental animals. UK J Pharm Biosci. 3:48-57. Mohammed, S. M., et al. (2015). Effects of broccoli on oxidative stress produced by lead acetate in male albino rats Rattus rattus. IJSRSET. 4:153-158. Zaghlool, S. S. et al. (2015). Comparison between the protective effects of famotidine, ginger and marshmallow on pyloric ligation-induced peptic ulcer in rats. J Bioequiv Availab. 7:170-178. Polat, M. et al. (2015). Assessing the effect of leptin on liver damage in case of hepatic injury associated with paracetamol poisoning. Gastroenterol Res Pract. 501:357360. Zaghlool, S. S. et al. (2015). Protective effects of ginger and marshmallow extracts on indomethacin-induced peptic ulcer in rats. J Nat Sci Biol Med. 6:421. Pérez, E. et al. (2015). Improved antitumor effect of paclitaxel administered in vivo as pH and glutathione-sensitive nanohydrogels. Int J Pharm. 492:10-19. Nuora, A. et al. (2015). The impact of beef steak thermal processing on lipid oxidation and postprandial inflammation related responses. Food Chem. 184:57-64. Ávalos, A. et al. (2015). Effects of silver and gold nanoparticles of different sizes in human pulmonary fibroblasts. Toxicol Mech Method.23:1-9. Mateo, D. et al. (2015). Comparative cytotoxicity evaluation of different size gold nanoparticles in human dermal fibroblasts. J Exp Nanosci. doi:10.1080/17458080.2015.1014934. Simon, B. R. et al. (2015). Cadmium alters the formation of benzo[a]pyrene DNA adducts in the RPTEC/TERT1 human renal proximal tubule epithelial cell line. Toxicol Rep. 14:391-400. Kim, D. H. et al. (2014). Anti-inflammatory effects of betaine on AOM/DSS‑induced colon tumorigenesis in ICR male mice. Int J Oncol. 45:1250-1256. Jiang, B. et al. (2014). Dihydromyricetin ameliorates the oxidative stress response induced by methylglyoxal via the AMPK/GLUT4 signaling pathway in PC12 cells. Brain Res Bull. 109:117-126. Iwami, H. et al. (2014). Protective effect of a laser-induced sub-lethal temperature rise on RPE cells from oxidative stress. Exp Eye Res. 124:37-47. Avalos, A. et al. (2014). Interactions of manufactured silver nanoparticles of different sizes with normal human dermal fibroblasts. Int Wound J. doi: 10.1111/iwj.12244. Avalos, A. et al. (2014). Cytotoxicity and ROS production of manufactured silver nanoparticles of different sizes in hepatoma and leukemia cells. J Appl Toxicol. 34:413-423. Orellana, C. A. et al. (2014). High-antibody-producing chinese hamster ovary cells up-regulate intracellular protein transport and glutathione synthesis. J Proteome Res. 14:609-618. Shen, Y. B. et al. (2014). Effect of Feed Grade l-Methionine on Growth Performance and Gut Health in Nursery Pigs Compared with Conventional dl-Methionine. J Anim Sci. 92:5530-5539. Hall, J. A. et al. (2014). Effect of Transport on Blood Selenium and Glutathione Status in Feeder Lambs. J Anim Sci. 92:4115-4122. Lim, J.H. et al. (2014). Targeting Mitochondrial Oxidative Metabolism in Melanoma Causes Metabolic Compensation through Glucose and Glutamine Utilization. Cancer Res. 74:3535-3545. Mohammad, M. K. et al. (2014). Watermelon (Citrullus lanatus (Thunb.) Matsum. and Nakai) juice modulates oxidative damage induced by low dose X-ray in mice. Biomed Res Int. 2014:512834. Mohamed, M. I. et al. (2014). Induction of Oxidative Stress Following Low Dose Ionizing Radiation in ICR Mice. World J Med Sci. 10:198-203. Mani, S. et al. (2013). Decreased Endogenous Production of Hydrogen Sulfide Accelerates Atherosclerosis. Circulation. 127: 2523-2534. Karakus, E. et al. (2013). Agomelatine: An Antidepressant with New Potent Hepatoprotective Effects on Paracetamol-Induced Liver Damage in Rats. Human and Experimental Toxicology. 10.01177/0960327112472994.